Home » Why Trust the Bible? 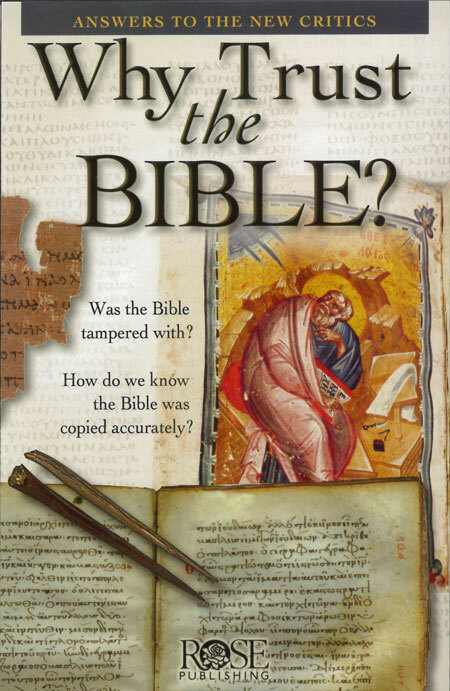 Throughout history people have wondered, What if the Bible was tampered with? The bestselling Why Trust the Bible? pamphlet offers compelling and reassuring answers to these important questions: “Can the Bible be trusted?” “How were the stories passed down?” “How can we know that the Bible was copied accurately?” “Who chose the books in my Bible?” and “How reliable is the Bible?” Full color and glossy, this 12-panel pamphlet is an excellent teaching tool for new believers and for those who have questions about Bible origins. Popular books promote doubts about the authenticity and accuracy of the Bible. Some suggest that the Bible is an ancient document that has been edited so many times that it is now filled with errors. Why Trust the Bible? equips believers to defend assaults against the Bible and to defend the faith. In five important questions, the author addresses what the skeptics claim and what history actually tells us. A time line reveals the development of key writings, the emergence of the biblical canon, and more. This great reference tool proves that the Bible can be trusted!